MY GROWING PASSION: Oh, my apologies, Pseudocheirus peregrinus. Oh, my apologies, Pseudocheirus peregrinus. But I thought I'd try to revive it with some water, and out leapt an exceedingly indignant ringtail possum! It stared at me from the branch behind for a few moments, then darted up onto the roof. 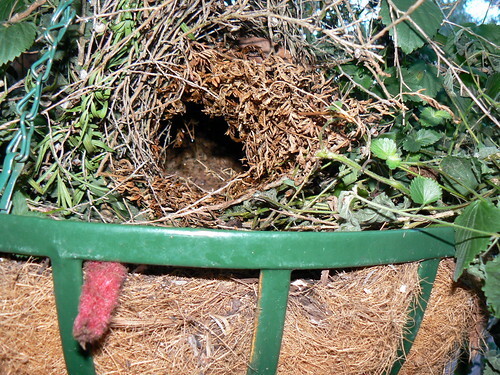 So I looked at the other side of the hanging basket and found its nest, beautifully constructed from various plants. It was probably very cosy until I drenched it. Hopefully, the possum will return once its home dries out. The Acalypha won't be getting any more water, so its days are numbered. I didn't get a photo given the possum's clear desire to run away, but here's one from the Australian Museum of a relative. As Margaret shows, Ringtail Possums construct nice little dreys for shelter. But there's often a bit of a shortage of the dense, fine twiggy foliage they prefer for this, particluarly after fire as in Margaret's area - hence their use of basket material in this case. 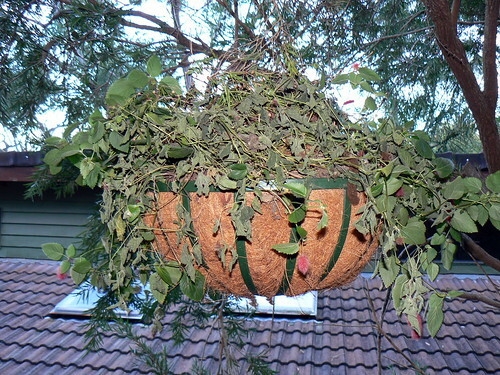 Desirable townhouses for ringtail possums can be made out of two hemispherical wire or wicker hanging planter baskets (larger sizes for family groups) wired together and lined with coir (coconut fibre) matting, of the sort sold in some nurseries. I suggest avoiding the coir matting that's impregnated with some type of plasticizer for moisture retention (feels tacky to touch) - that seems to me likely to be unhealthy. Plain free-draining coir matting much better. Lace it on to the inside of the wire frame with tough twine. The result looks like a hairy soccer ball. Be sure to cut into the wire or wicker frame TWO entrances on the upper half of the sphere - one main door and a slightly smaller bolt-hole - they like an escape hatch. Cut flaps in the coir and tie them just slightly open and able to be pushed wide - this makes an awning. File off any jagged wire ends. A roof is not essential if the matting is thick, but a loosely fitted plywood or plastic cap can be attached that helps keep the little buggers dry and prolongs the life of the drey. They will love you to bits. Alternative of course is to leave bits of coir and long whippy tea-tree twigs out and let them do it themselves, but it's kind of nice when they move happily into your constructed drey. Now I know how that nice Mr Meriton feels (except the filthy rich bit). Bob! Great to have you "visit". That sounds an excellent recipe for a drey. How large a territory do ringtails have? As I recall, brushtails tend to have a limited number of individuals within a certain area. Given that this ringtail is happy on the front verandah, would making another drey for out the back work well? I'm also thinking of buying a pardalote box from National Parks, because I've seen quite a few Spotted Pardalotes in the garden. They seem to have remarkably specific nesting requirements! That basket just wasn't big enough for that plant and the possum. It looked such a great nest. Quite amazing how they construct them. Is there such a creature as a 'kinkajou' in your area? I know I've heard the term, but it may be akin to the infamous 'drop bear', for all this 'Merkin knows! I confess I'd never heard of a kinkajou before, but I just looked it up on Wikipedia, and it seems it's a beastie from Central/South America. Looks like an extraordinary creature! Looks like we EACH learned something gnu today! In either case, learning is a Good Thing, even at my age.